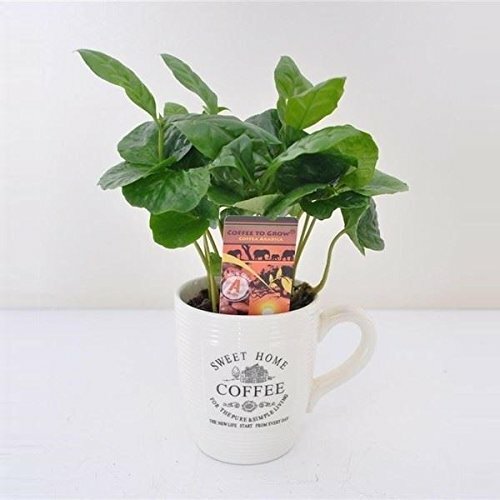 This Coffee arabica plant would make an unusual gift. It is presented in a ceramic coffee cup. Native to tropical Africa, there are actually 125 species of coffee, most of which grows at high altitude. Arabica is one of the main beverage species. In the wild it forms a small tree or large shrub which can grow from 2 to 8 meters tall. The tree has horizontally branching stems, although it is pruned on plantations to a small shrub size. The coffee drink is made from the roasted seeds of the plant. The shiny red fruits are picked and the seeds or beans are sent to mills in order to remove the hard outer layer. Coffee has been popular as a drink since the 17th century. The seeds contain caffeine which is a stimulant. Coffee wood can be used in construction. Protect this plant from frost. It is not hardy here in the UK.